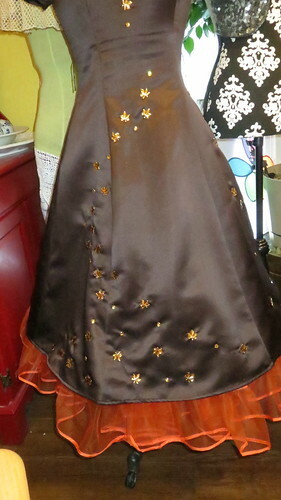 My oldest daughter has a formal to go to soon so I am working on a dress for her to wear to it. 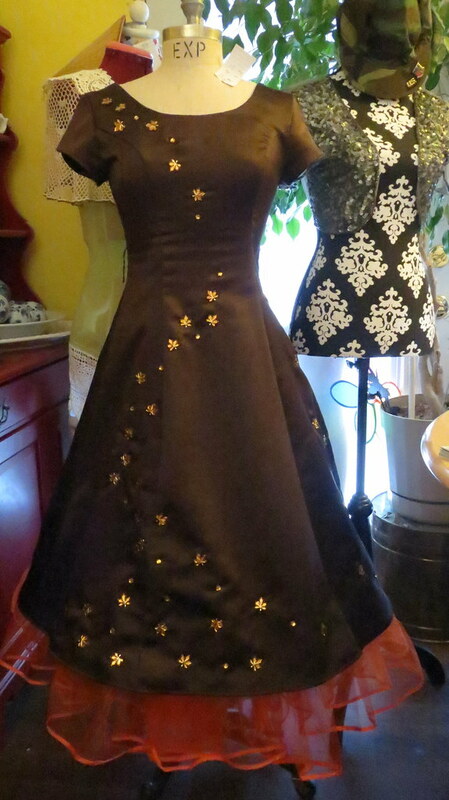 The dress is deep chocolate brown hard to tell in the photos. Also it has tulip sleeves which I for got to take a picture of from the side so you could see that. 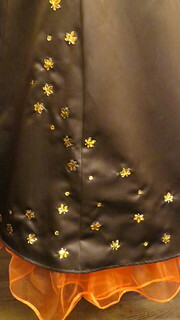 I have sewn on to it lots and lots of leaves and little circle burnt umber sequins. The leaves are supposed to look like they are swirling and falling into a big pile of leaves at the hem I hope I achieved my goal and that is doesn't just look sort of weird to people.I still have yet to steam the dress from having sewn on the sequins most of these wrinkles will go away at that time. I plan on making an orange satin sash to go around the waist that ties in the back of the dress with a large bow and either has pleats or gathers in the front. So if you were wondering why the gap in the sequins at the waist that is the reason why there is going to be a belt there that I have yet to even buy the fabric for. 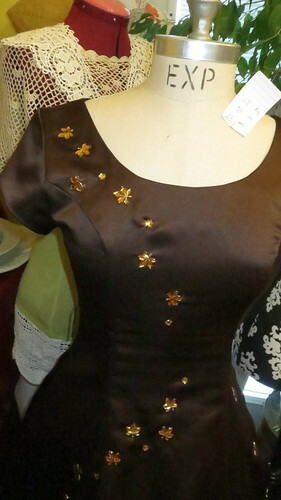 Wish me luck on finding something that will match so to speak either the orange crinoline or the burnt umber sequins. We do like the look of the crinoline peeking out the bottom of the dress that is not a mistake. 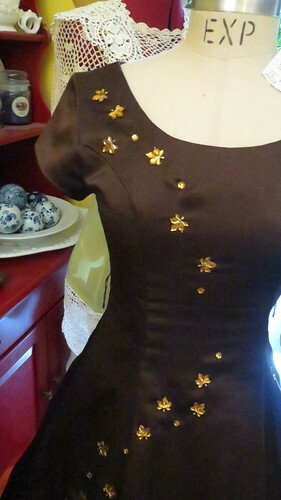 The brown dress was an $8.00 thrift shop find that I am revamping. I also think I will be making a choker to go with this dress with a few of the leaves on it as well. I love the swirl, looks great, you have kept it narrow so its shape is well-defined. I know I have said this before, but wow your girls are lucky to have such a clever mother! I wish mine had been able to make me custom dresses. I didn't even particularly like the one I wore to my final ball at high school. Beautiful work! Can't wait to see it with the sash and choker!